Discovering Levanto, its sea, its surroundings, its history. Many consider it – rightly, of course – the gateway to the Cinque Terre. That “something more” that you can hardly find in a guide book or in the classic advice on what to do or see. That feeling – sudden and intense – to feel at home, feeling that every visitor knows how to make his own in his own way, who has accompanied me, never leaving me alone during the days spent in this beautiful corner of Liguria and getting from the beginning into a sort of sweet, melancholy longing. Levanto is hospitality, sea, flavors, architecture and lots and lots of history. It is the smile of its people, the kindness in helping you with directions to a path, the bright colors and decorations of its ancient and charming houses, the maze of alleys that wind from the hills, the gentle sound of the bells of its old churches. Levanto is the smell of the sea and its flavor that comes up to the table, the aroma of a freshly baked focaccia, hospitality and authenticity of a small jewel oh so Italian. I think back to the variety of routes and thematic itineraries that satisfy the most demanding visitor, and I find myself, as if by magic, walking the streets of the ancient village following the path that leads up the hill to the picturesque square of the Church of San Andrea and then further on to the walls of the old Castle of San Giorgio. Distracted by the sound of a distant bell back down to the Medieval Loggia and from there mesmerized by the incessant tolling date back to the Oratory of St. Giacomo. I continue in a swing of up and down through a series of narrow streets, which intersect with each other and at times revealing secrets glimpses, fragments of life passed that refer to a Levanto distant in time. Following the colors and original decorations of the eighteenth-century mansions of Via Garibaldi I find myself in a small chapel behind Piazza Cavour, the old Oratorio di San Rocco. And that’s where I seat to observe the magnetic wooden crucifix and lose track of time. It is morning, a clear early May morning. I choose to walk the path # 1 heading south, towards the Cinque Terre. The air is crisp and the sun already high, the path climbs up the mountain giving me sometimes breathtaking scenery on the coast, and shortly after snapshots of the interior, a kind of magic forest made of rocks, branches and trunks in which light filter in bundles. I got the most welcome surprise once at Punta Mesco with an unforgettable view of Monterosso and then Vernazza and then again Corniglia and Manarola and finally Riomaggiore … the little paradise of the Cinque Terre. Fatigue does not stop me from wandering curiously around the old village of Monterosso and at the end gives me a refreshing break right on the waterfront with freshly baked focaccia, tomatoes, salad and soft cheese … I can still taste it. As if I were flipping through snapshots imprinted on an old camera roll there’s a sudden change of scenery and I find myself walking at sunset on the seafront in Levanto, it is almost dark, the wind suddenly rises and with it the big waves on the horizon. .. I walk away unwillingly, it’s dinner time, a typical Ligurian dinner. I remember the smell of trenette with seafood eaten a few steps from the sea and the lights of the villas at “La Pietra” (i.e. the stone) reflecting on the water. It’s morning again, I walk – this time heading north – along the coastline through the eighteen century ancient railway road and then up to Bonassola and Framura. A series of tunnels and amazing views overlooking the sea and then small coves, houses on the rocks and beaches … the water is crystal clear, the sky of a shiny blue, the desire to dive is really big, but alas my free time always too short. I already know that I will return. Levanto is always a good idea. Whether for a short, intense weekend or a long, relaxing holiday. In the warm embrace and fragrances of spring, in the heart of the warm and lush Mediterranean summer, in the most striking autumn bright colors or the magic of a not too hard winter. Pack a casual outerwear and comfortable shoes, pick a hotel downtown and forget your car in the parking lot, at least till your departure. 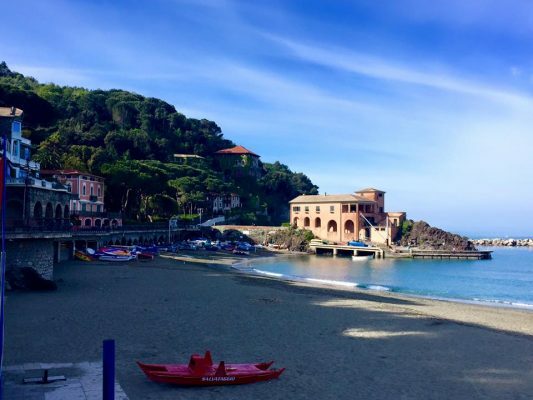 Levanto will surprise you in a thousand different ways, and then will make you return.